Referee Fees are posted on Arbiter go to SCHEDULE > Display > List View > Set the Filter > Apply. Under the column "Fees" is how much you will paid for your games. League Referee fees are posted on the League's website for each season. Referee fees for League games are collected on the field. The only exception is some playoff championship matches, which you will be informed. 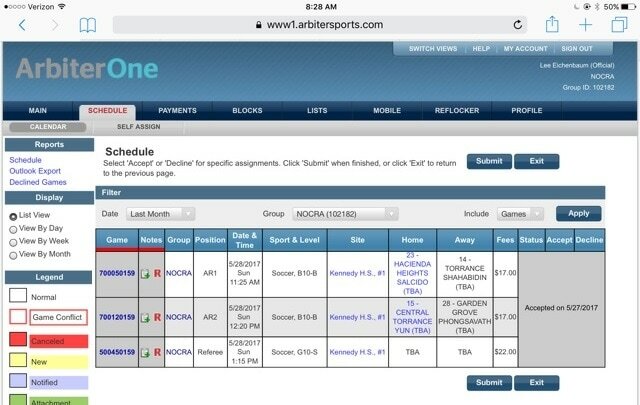 For Tournaments you will be paid by NOCRA, only exception is CalSouth State and National Cup games. 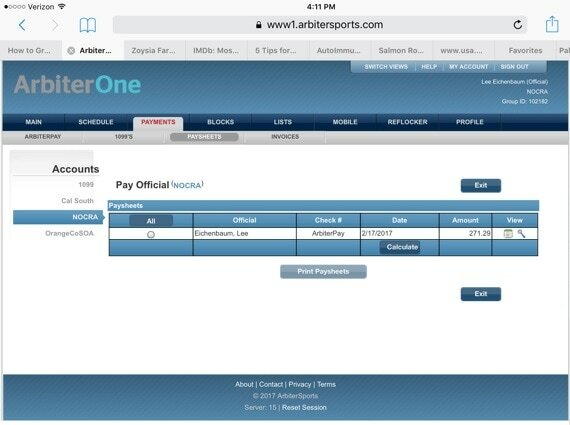 Tournament referee payments are paid by ArbiterPay or check. You will be paid as soon as we receive payment from the tournament. To review your referee payment for a Tournament go to Arbiter > Payments > Paysheets > View (click on the calendar for more detail). If the Check # column is blank that means we have not received payment from the tournament yet. It is faster and easier to receive payments using ArbiterPay. Go to Arbiter.com > login > Payments > ArbitrePay > click "SIGN UP TODAY!" > follow the directions. If you want your payment automatically transferred there is a fee. If you prefer to transfer the money yourself do not select the automatic transfer option. Go to "My Preferences" to check your account settings. From your arbiter account, go to payments. Select ArbiterPay, click on "Click ArbiterPay to Login" you will be directed to another page- RefPay. Go to "My Profile" if you do not see an email address when you are at this point, select modify to add one. If an email address is present, continue on.